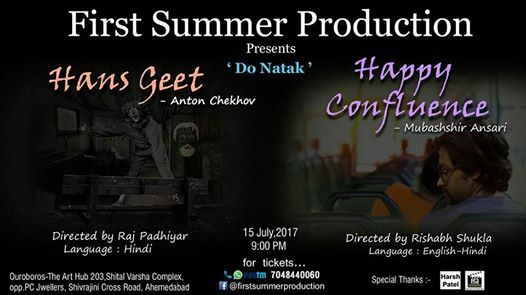 Here comes ‘Do Natak’ by First Summer Production. Hansgeet: ‘Hansgeet’ means a final piece performed by an artist before the audience. A play written by Anton Chekov staged by Raj Padhiyar is a tale of legendary performer reflecting upon his life. After pulling a very fine performance the performer finds himself locked in the Theatre, all alone with no one to accompany him except the Prompter. He opens up with him and carry on with the talks of his life, which has been through all the peaks and potholes, from good old days to his present situation where he feels lonely, old, neglected and weak. Happy Confluence : A story of love set up in present generation written by Mubashshir Ansari and directed by Rishabh Shukla. Written from an intoverts point of view it has all his minute observations, his imaginations, his vivid emotions captured in detail, his small actions resulting after a serious of thoughts. An introvert’s encounter with a beautiful girl and the journey thereafter.